Relax after a busy day in our comfortable hotel rooms complete with air-conditioning, complimentary Wi-Fi access, direct dial telephone, work desk, LCD television, refrigerator, tea and coffee making facilities, ensuite with hairdryer and a home away from home feel. Park Regis Concierge Apartments are in the prime position to ensure guests are close to numerous health and leisure options. Stay fit and pamper yourself at the local fitness centres, swimming pools, beauty and hair salons. Day Spas There are a few day spas close to Cremorne or you can visit Sydney city for a number of different options. Hair Salons There are a countless number of hair salons close to Park Regis Concierge Apartments. Ask our staff to recommend one to suit you. Swimming Pools Take a dip or a few laps at one of the great swimming pools nearby. Fitness Centres Sydney has an active population and there are numerous fitness options to suit your work out regimen. Business Services Park Regis Concierge Apartments offers essential business services to business and leisure guests including photocopying, printing, faxing and booking conference and meeting spaces. Discover an array of quality restaurants, bars and pubs within close proximity of Park Regis Concierge Apartments. Restaurants Guests will have access to a number of quality Australian and international dining options. Bars No matter what type of pub or bar you are looking for, Park Regis Concierge Apartments guests will be spoilt for choice. Nightlife Sydney's nightlife is unbeatable for choice, with bars, clubs, festivals and year-round cultural events you will find something almost every day of the week! Cafes You are guaranteed to find a café for coffee, breakfast, lunch or dinner for every day of the week in Cremorne. We are happy to recommend Hotel Cremorne for your function and event needs. They are located right next-door! 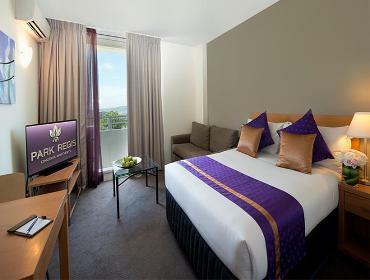 Hotel Cremorne Hotel Cremorne is adjacent to Park Regis Concierge Apartments and is the preferred venue for guests' function and event requirements. Wedding Accommodation All our function rooms can be adapted to your needs whether corporate focused meetings or cocktail parties or family events and celebrations.